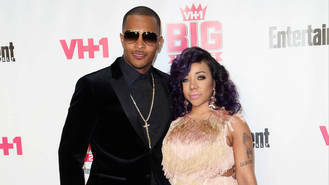 The former Xscape singer filed papers to end her 15-year marriage to the 36-year-old hip hop superstar in Georgia earlier this month (Dec16), according to TMZ. Sources tell the outlet the couple had been experiencing a prolonged rough patch for several months before a shocking picture of Tiny posing with T.I. 's longtime foe, boxer Floyd Mayweather, at Mariah Carey's Halloween party surfaced in October (16). The fighter and the rapper were involved in a street brawl in Las Vegas in 2014, reportedly sparked by jealousy over Tiny after she posted images of herself partying with Floyd and his entourage online, and the musician became incensed his spouse had spent personal time with the athlete without him. This year has been a turbulent year for the couple - back in February (16) the Whatever You Like hitmaker was slapped with a tax lien from America's Internal Revenue Service (IRS), just six months after he was pursued by bosses at the national financial organisation in August (15) for unpaid back taxes, totalling $4.5 million (£3.7 million) for the years of 2012 and 2013. A few months later, in June (16), T.I. 's only stepdaughter Zonnique Pullins, who is Tameka's biological daughter from a previous relationship, was arrested for gun possession. After the rapper and Cottle tied the knot in 2001, they had three children together, including their newest addition, a daughter named Heiress, who was born in March (16). T.I. also has three children from prior relationships.